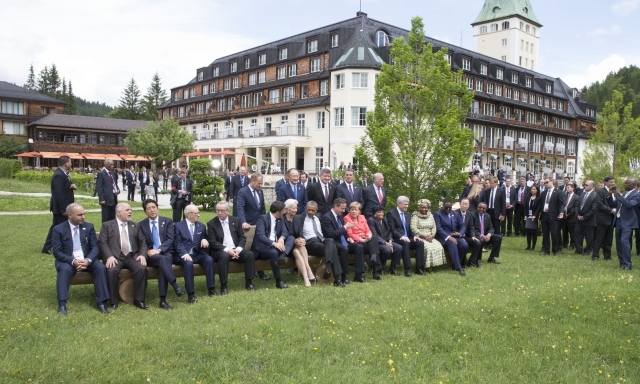 On 7-8 June 2015, Germany hosted the meeting of the G7 heads of state and government. The 7 leaders are photographed here with their outreach guests. (European Council – Council of the European Union Audiovisual Services). Last weekend the leaders of the G7 countries in reality acknowledged their impotency or probably unwillingness to effectively confront the expansion of the destructive and unlawful activities of the “too big to fail” banks and the shadow banking sector. After that, they decided that Ukraine and Greece have to go on bleeding in order not to disturb the plans for the monstrous creation of a ‘brave new world’. As for their “Dialog with the African nations” any conscious observer would shiver thinking about what happens every time they intervene in Africa. Just think what has become of Sudan, Congo, Somalia, Niger, Angola, Mali, Chad and other African nations. The leaders also ‘discussed’ about “The situations in Syria, Iraq and Libya and other security related issues…”, and reportedly they appeared rather happy about the destruction they have caused there. Let’s leave Africa and come back to Europe, to a presumably more structured and wealthy environment. As expected, the G7 paid special attention to Ukraine and Greece, the two European crisis countries where large parts of the populations endure much worse security and economic conditions than many African nations. Surprisingly enough, the G7 appeared united and adamant that in both those countries the policies imposed by the EU and the US are to be continued. In the case of Ukraine, Donald Tusk the President of the European Council, stated that the G7 will for sure continue supporting Kiev in every conceivable way against the Russian speaking autonomists. He also added that the sanctions against Russia can only be stiffened. He didn’t leave the slightest opening for reconciliation with Moscow, just because Russia incorporated a region which has always been a part of her, that is the Crimean peninsula. This Polish politician may be rightly biased against Moscow for the fifty years the USSR subjugated his country, but as an EU dignitary he ought not to act under such national idiosyncrasies. The truth is probably that this eccentricity must have been Tusk’s major quality while being appointed as President of the EU Council. On every occasion he gladly pays back this favour to those who have chosen him, especially whenever Russia is the subject matter. This US and EU policy line though is cutting Europe in two. As in the Cold War, only this time Poland and Western Ukraine constitute the fortification line and cushion to keep Russia away from the rest of the Old Continent. The European map is very eloquent on this issue. This is the game the West now plays in Europe. Unfortunately, the leaders of the US and the EU don’t seem to understand the long-term strategic dangers, while cutting Russia out from the rest of Europe and pressing her to turn eastwards. It’s very plausible that for the first time in history Russia may fully and strategically align herself with China. Now what about Greece? At the time that the G7 Summit was taking place in Schloss Elmau in Germany, Athens and Brussels were negotiating a way out from the Greek labyrinth. Of course the bosses were sitting around the G7 table. The verdict they issued was to reject the Athens proposals, terming them as irrelevant. Greece is now expected by its EU partners to apply the worst recipe, which is the continuation of the catastrophic policies applied during the past five years. Again it’s the shocking tax increases and the horizontal cuts in wages, pensions and the social security budget. This is a slow strangling procedure of a country that has already lost one quarter of its GDP and may continue bleeding. This time however, the US look like having aligned with Germany, departing from the stance Washington had been maintaining so far in relation to the Greek question. Until last weekend the Americans had been strongly criticizing the European recipe for Greece, calling it a straight road to more recession. Until recently, the International Monetary Fund was asking Greece’s European lenders to wright off a good part of the debt as the only way for Greece to one day return to normality. Seemingly, Christine Lagarde, IMF’s Managing Director, is now parting from this position. Unfortunately, after the G7 Summit in Germany, Barack Obama, the President of the US, changed his attitude and asked Greece on Sunday to swallow the bitter portion. So far he personally had been opposing Angela Merkel’s policies for Greece and he had asked her “to come up with a plan to bring Greece to a sustainable growth path”. Seemingly he has changed all that now. This is probably due to the stupid Athens courting with Moscow over an utterly elusive plan for a pipe line on Greek soil to transport Russian natural gas to Europe. Understandably, the American decision-makers detest whatever connects Russia with the Western Europe and Greece fell in the trap. In short, the G7 leaders after reciting tautologies and wishful thinking in their Declaration of 7-8 June 2015 about the burning world issues like global growth, the environment and nuclear safety, they adopted the most dangerous US and EU views on Ukraine and Greece.